While we always have our ear to what the streets are saying, it’s time for the whole of Hindustan to hear what you got! Along with our friends at Excel Entertainment, the makers of the upcoming movie – Gully Boy, we are so excited for what’s lined up for you! 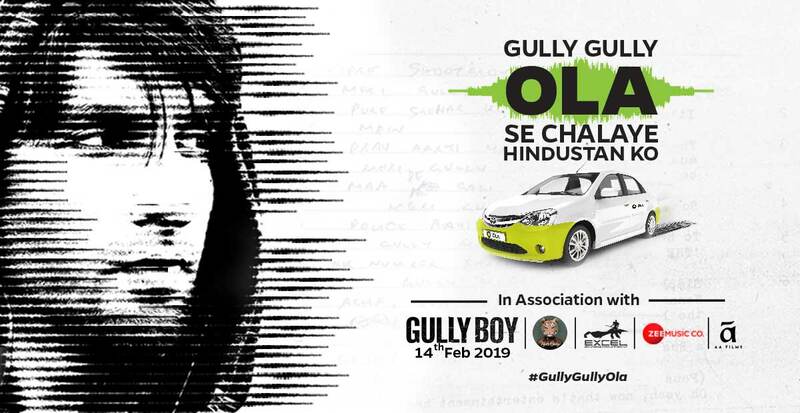 Now you can rap straight from the heart to all of India …from the backseat of your Ola with #GullyGullyOla. How about we let the star of Gully Boy (and the boy who’s living the dream) Ranveer Singh, tell it to you himself? That’s it! Next, comes the best part. The prize will pakka make you go crazy. Not only will you be seen and heard by millions across the country, 10 of the best rap entries will get a chance to go meet Ranveer Singh himself! That’s not all, there are 100s of Gully Boy goodies also in store for you to win. Yes, you read that right. What say, are you ready to rap your way into the hearts of Hindustan with #GullyGullyOla ? And lest you forget, take some friends along to catch Ranveer Singh on the big screen in a theatre near you! Gully Boy releases on 14th Feb. The activity is exclusive for Ola users in India only. Applicable on all Ola rides. Each entry will be rated and the ratings will be decided by Ola based on theme, creativity and picture clarity. Top 10 entries from the Eligible Participants shall be shortlisted for the Meet & Greet with the actor Ranveer Singh (“Selected Participants”). By participating in the Ola Contest, all Eligible Participants hereby consents to the accessing of information and/or images of the Participant by Ola and/or its affiliates for the purpose of this Ola Contest. Further, Ola shall be at liberty to use the Participant information for its media coverage, advertisement or publicity in any form which is existing today or will be known anytime in the future without any further consideration to the Participant. Ola reserves the right to change/alter/modify any of the terms and conditions under this Ola Contest at its sole and absolute discretion. No other Selected Participant who is not a declared Winner shall raise any claims whatsoever. For the purposes of the Ola Contest, a valid Ola ride shall mean an Eligible Participants completed ride for which the Eligible Participant has paid the full fare required to be paid for the relevant category of any of the Ola Services availed. Winners will be announced by Ola on 13th February, 2019. To avail the giveaways, it is mandatory for the customer to share his/ her personal details. Winner will be announced post conclusion of the contest. The Ola Contest is applicable only to persons who are users of the Ola App and meet the eligibility criteria applicable to usage of the Ola App (“Customer(s)/You/Your”). By participating in the Ola Contest, the Participant warrants that all information provided by the Participant regarding his/her name, age, state, city, address, phone number etc., is true, correct, accurate and complete and that the Participant is authorized to provide such information and consents to the use of such information by Ola and/or affiliates. Participant agrees and consents that any and all information submitted by the Participant, including but not limited to, the submissions and personal information of the Participants may be required to be shared with other third parties engaged by Ola, for the purposes of verifying the authenticity, eligibility of the Participants as well as for the purposes of Ola’s promotional activities in relation to the Ola Contest. Participant gives Ola the right to publish and broadcast anywhere in the world, for editorial, advertising, promotional, marketing and/or other purposes and in any media, Participant’s and/or Winner’s name, image, likeness and/or photograph (except where prohibited by law) without any further permission, consent or consideration in any form, by whatever name called. Participant hereby agrees to indemnify and keep Ola, its associated companies and affiliates, and respective directors, officers, employees, contractors and agents, indemnified against any and all losses, claims (including but not limited to, third party claims), injuries, costs, fees, fines, penalties, taxes, charges and any other liability arising out of any act of omission, commission, fraud, deception, misrepresentation of any representations and warranties, negligence or misconduct by the Participant or violation of any applicable laws. This entry was posted in Uncategorized on February 10, 2019 by Pooja Kiran.